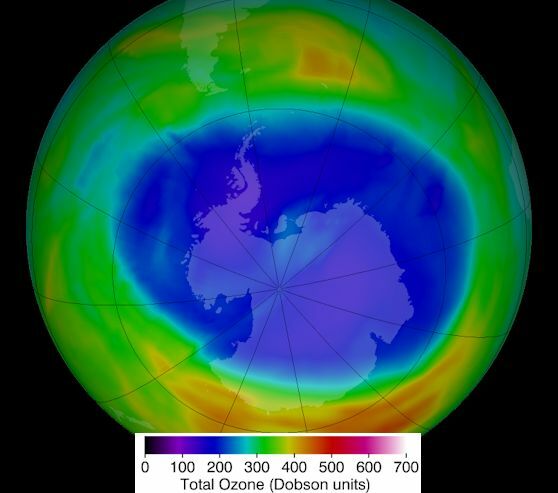 Oct 30, 2014: The Antarctic ozone hole reached its annual peak size on Sept. 11, according to scientists from NASA and the National Oceanic and Atmospheric Administration (NOAA). The size of this year’s hole was 24.1 million square kilometers (9.3 million square miles) — an area roughly the size of North America. The single-day maximum area was similar to that in 2013, which reached 24.0 million square kilometers (9.3 million square miles). The largest single-day ozone hole ever recorded by satellite was 29.9 million square kilometers (11.5 million square miles) on Sept. 9, 2000. Overall, the 2014 ozone hole is smaller than the large holes of the 1998–2006 period, and is comparable to 2010, 2012, and 2013. With the increased atmospheric chlorine levels present since the 1980s, the Antarctic ozone hole forms and expands during the Southern Hemisphere spring (August and September). The ozone layer helps shield life on Earth from potentially harmful ultraviolet radiation that can cause skin cancer and damage plants. The Montreal Protocol agreement beginning in 1987 regulated ozone depleting substances, such as chlorine-containing chlorofluorocarbons and bromine-containing halons. The 2014 level of these substances over Antarctica has declined about 9 percent below the record maximum in 2000. Scientists are working to determine if the ozone hole trend over the last decade is a result of temperature increases or chorine declines. An increase of stratospheric temperature over Antarctica would decrease the ozone hole’s area. Satellite and ground-based measurements show that chlorine levels are declining, but stratospheric temperature analyses in that region are less reliable for determining long-term trends. 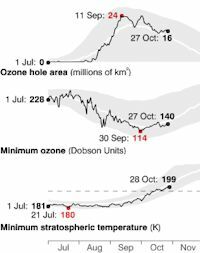 Scientists also found that the minimum thickness of ozone layer this year was recorded at 114 Dobson units on Sept. 30, compared to 250-350 Dobson units during the 1960s. Over the last 50 years satellite and ground-based records over Antarctica show ozone column amounts ranging from 100 to 400 Dobson units, which translates to about 1 millimeter (1/25 inch) to 5 millimeters (1/6 inch) of ozone in a layer if all of the ozone were brought down to the surface. The ozone data come from the Dutch-Finnish Ozone Monitoring Instrument on NASA’s Aura satellite and the Ozone Monitoring and Profiler Suite instrument on the NASA-NOAA Suomi National Polar-orbiting Partnership satellite. NOAA measurements at South Pole station monitor the ozone layer above that location by means of Dobson spectrophotometer and regular ozone-sonde balloon launches that record the thickness of the ozone layer and its vertical distribution. Chlorine amounts are estimated using NOAA and NASA ground measurements and observations from the Microwave Limb Sounder aboard NASA’s Aura satellite. NASA and NOAA are mandated under the Clean Air Act to monitor ozone-depleting gases and stratospheric depletion of ozone. Scientists from NASA and NOAA have been monitoring the ozone layer and the concentrations of ozone-depleting substances and their breakdown products from the ground and with a variety of instruments on satellites and balloons since the 1970s. These observations allow us to provide a continuous long-term record to track the long-term and year-to-year evolution of ozone amounts.